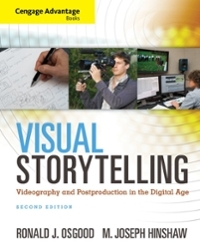 Cengage Advantage Books: Visual Storytelling 2 Edition VISUAL STORYTELLING: VIDEOGRAPHY AND POST PRODUCTION IN THE DIGITAL AGE SECOND EDITION combines a thorough exploration of essential storytelling concepts with detailed instruction in practical technical skills. Without limiting its focus to a particular range of equipment, applications, or technology, this engaging text covers the key concepts, aesthetics, and techniques of single-camera field production and post production, and includes real-life stories and suggestions from working professionals. The accompanying website illustrates and expands on text concepts with pedagogically sound interactive learning modules as well as the capability to download high definition video footage for editing exercises.